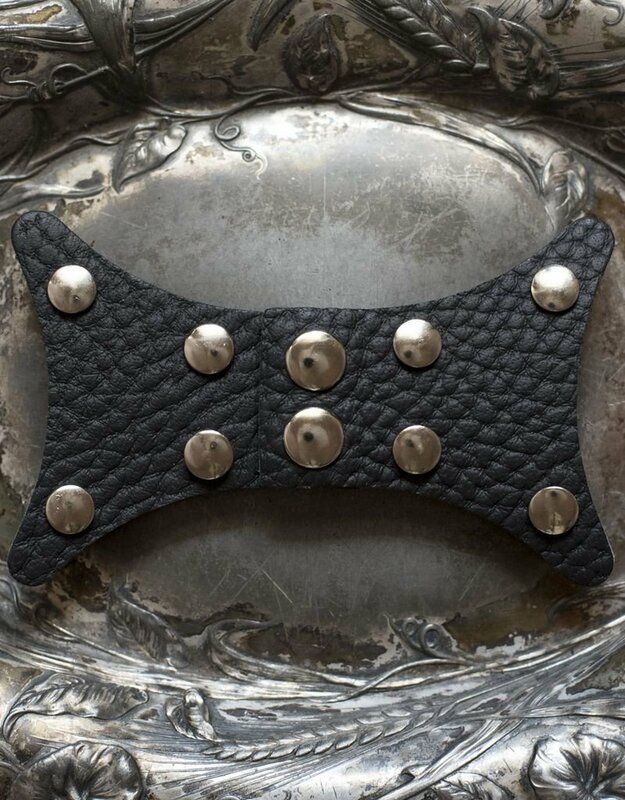 Made in the USA 100% Genuine Leather 5 inches wide by 3 inches tall Available in Smooth Black and Pebble Black The Gate Hinge is based, in dimensions and shape, on an old rusty barn hinge, almost down to the location of the holes that once held wood screws. 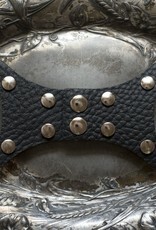 This hinge is wide and simple, adding drama to any garment or accessory on which it is placed. Though this and other JUL screw-in closures were originally designed for knitwear, they may be applied to any garment to which one wants to add a snap closure and an exciting and unique fashion statement. The Gate Hinge may be attached in two ways -- with screws and with leather lace. Each package contains both. The screws are used in the same manner as other JUL closures, where the threaded cylinder goes through the fabric and is held in place on the back with plastic washers and then the male part screws into the cylinder to hold the closure in place. The Gate Hinge has an additional mode of attachment. It may be 'sewn' onto knitted, crocheted, and handwoven garments and accessories by threading the leather lacing from the back to the front and then tying in the back. This method of attachment is ideal for large fiber or pieces with open work and large holes where the provided washers might be inclined to pull through from the back to the front. The laces wrap around fiber, captering multiple stitches on the back. The Gate Hinge when stitiched onto the garment is lighter than when attached with metal screws, allowing it to be used not only with large fiber, but with lighter, airier fabrics and fibers.